Monday is normally a miserable day for cryptocurrencies, and commonly referred to as bloody Monday. Coins tend to see red during the first day of the week. Following a sideways run over the weekend, the market appears to have hit a green streak as most alts were up on Monday. The weekend saw the market stall, following a climatic two weeks of solid gains. Bitcoin soared to over $5,000 before looking primed for a retrace. However, the retrace has not occurred and instead, BTC is up 2.38% today, now sitting at $5,184. 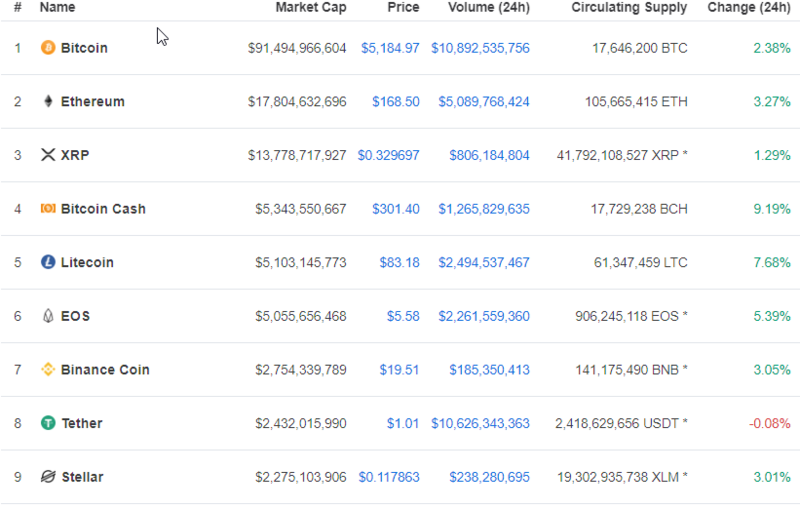 The entire top 10 saw gains on Monday morning with Bitcoin Cash once again being the biggest gainer with a 9.19% gain in price, breaking back over $300. While total volume appears to have dramatically declined compared to the $80 billion volume recorded a couple of weeks ago, the market cap remains over $170 billion. While bitcoin sentiment over the past week has remained mixed as to weather BTC will be bullish or bearish, no one seems to quite know which direction the price is headed. BTC volume had most definitely slowed and could be a catalyst for a move back down, however the strong weekly close has triggered bullish sentiment with some traders. This week could prove important for bulls to push BTC to higher $5,000 prices in the coming weeks. On lower time frames, #bitcoin is looking like it wants to retest the .382 level at $5200 in an ascending triangle pattern. Bulls need to see us reclaim that level with volume to feel comfortable in longs. Tezos (XTZ) saw the biggest climb on Monday, with a 19.94% price increase, with the current price sitting at $1.16. 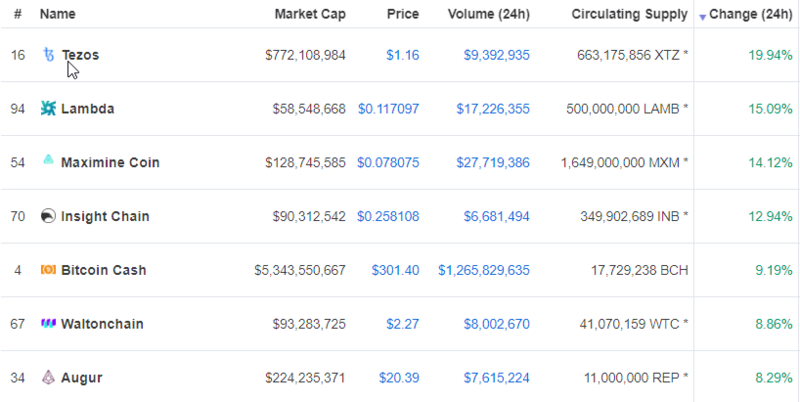 BCH was the 5th biggest gainer in the top 100. What will BTC price will hit next?